Purchase 50 or more CPR Pocket Masks and download your free support pack worth £100. Purchase 200 or more CPR Pocket Masks and you can have personalised covers absolutely free! 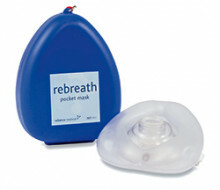 A reusable pocket mask for protection by the resuscitator when performing mouth to mouth resuscitation. Comes in a durable plastic box with strap.